Upon the initiative of Ms. Sonia Hornery, a meeting was held at the New South Wales Parliament in Sydney in support of the Iranian Resistance and women’s role in the movement against the ruling regime in Iran. 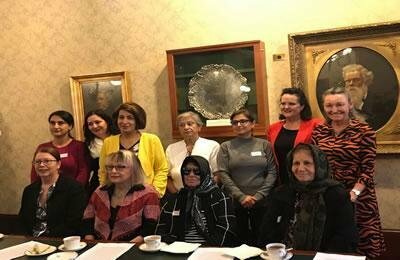 A number of Australian supporters of the Iranian Resistance including Ms. Meredith Burgmann and Mr. Peter Murphy as well as a number of Iranian women supporting the Resistance, participated in the meeting at Parks Hall on May 23, 2018. Ms. Hornery, member of the Parliament of New South Wales, welcomed the participants and expressed her own and her colleagues’ utmost support for the struggle of Iranian people, especially Iranian women, and praised their courage in fighting the clerical dictatorship. Then the participants exchanged views on the situation of women in Iran and the Iranian women’s struggle. The Iranian women attending the event explained about the problems and adversities women face under the rule of the clerical regime and the role of women in the Resistance and the ongoing uprising. Ms. Elham Zanjani, from the NCRI’s Women’s Committee, addressed the meeting via a video link. In the end, she elaborated on the role of the Iranian Resistance’s President-elect Maryam Rajavi in educating and training a new generation of women to lead the Resistance movement. She pointed out that Mrs. Rajavi’s Ten-point Plan is an inspiration to the women of Iran in their struggle for a bright future and a free Iran.